The following is intended to be an example of what you should do if you find yourself involved in a car crash. You are driving home from work on your usual route, when, out of nowhere, you hear the crunching metal and the busting glass. You feel yourself spinning with no control of your vehicle. You’re shocked. What just happened? How did it happen? Why did it happen to you? In what seems like seconds, complete strangers are running up to your car, asking if you’re all right. It all happened so fast, and it’s difficult to gather your thoughts. But here’s what you need to remember. 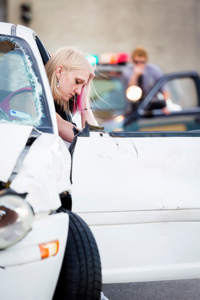 Take a mental inventory of any injuries you have before exiting your vehicle. If you’re in pain, stay where you are – do not move. If your cellphone is within reaching distance, call 911, even if the other driver asks that the police stay out of it. Tell the dispatcher that you require police assistance and an ambulance, even if it appears no one was injured. After calling 911, ask the other driver to exchange insurance information with you. Jot down the driver’s name, vehicle information, policy number, policy company name and policy company phone number. Continue to write down details you remember leading up to the accident. This is important, because you might not remember as many details even just a few hours later. You will often be asked to repeat your story over and over, and you want to make sure you are accurate in your description. Include the direction you were heading, the time the car accident occurred and how fast you were driving. As you wait for the police to arrive, if you’re able, use your cellphone to take pictures of the crash site. If there are people who stopped to see if you needed assistance, ask if they saw the car accident take place. Politely ask her for their names and contact information, and any details they recall. You can also ask if they would mind speaking to the police once they arrive. Once the police officer arrives at the scene, answer the officer’s questions truthfully and with as much detail as possible. When he has finished interviewing you, ask how you can receive the completed police report. When the ambulance arrives, be sure to ask for medical attention, even if you feel OK. Often initial shock hides injuries that may appear later. Medical professionals will be able to describe typical pain and soreness you may feel a few hours later or the next day. If you feel something atypical, you should head to the doctor right away. If a medical professional at the accident scene suggests you head to the ER, even if you’re feeling OK, go for an examination to ensure you do not have internal bleeding or sprains. Then call our experienced personal injury lawyers. We can help guide you through the grueling process to come. We’re here 24/7 to get you the Results You Deserve.